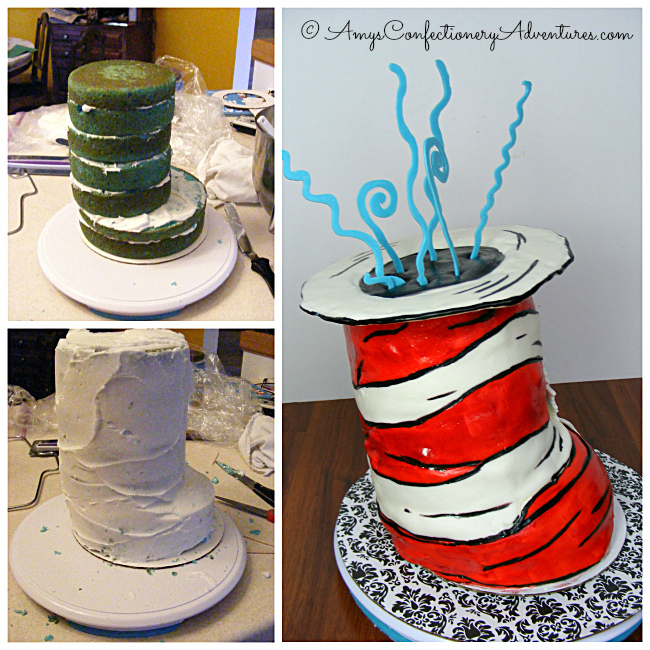 Keeping on with my little Dr.Seuss theme, today I have a super fun Cat in the Hat Cake! This fun cake was for a baby shower for a Momma-to-be who is expecting twin boys later this summer! To make this cake, I baked a full recipe of White Almond Sour Cream Cake (tinted sky blue). I baked the cake into 4 ½ 6-inch cakes and 1 ½ 8-inch cakes. 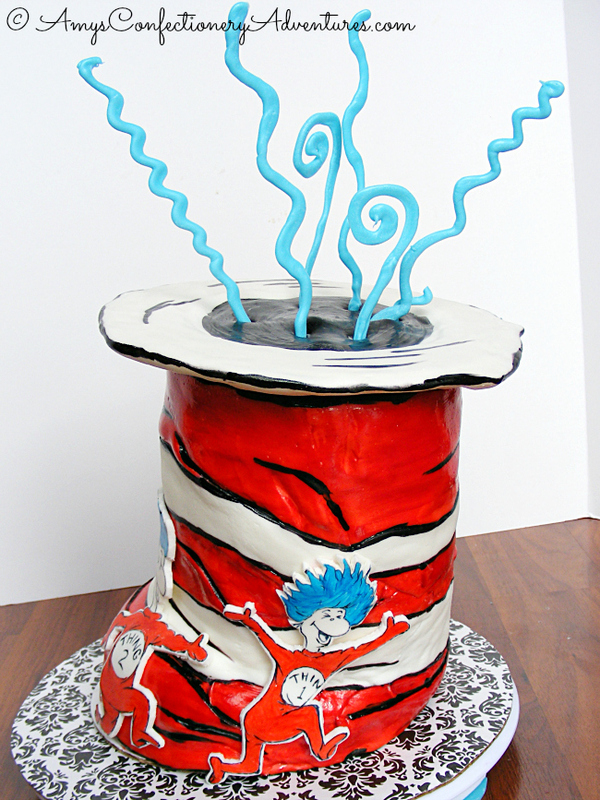 After carving the hat shape a bit, I added a layer of buttercream, and covered it in MM Fondant. The stripes were painted in with some watered down gel food coloring. 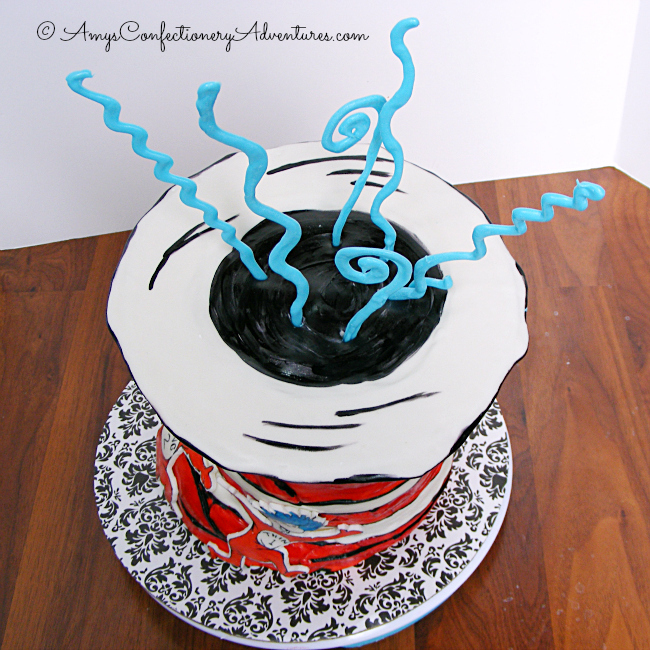 For the brim of the hat, I covered an 8-inch cake circle with white fondant. And the blue swirlies were blue candy melts. 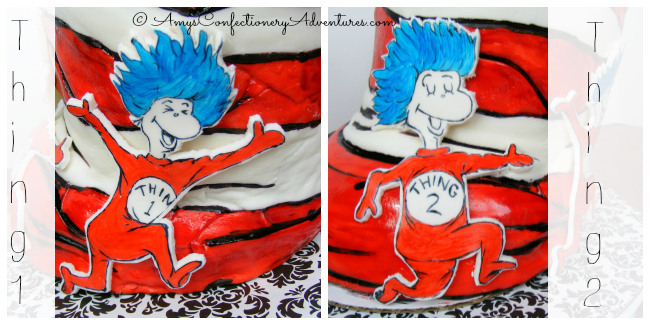 My amazingly talented husband, aka chief art consultant, drew Thing 1 & Thing 2 for me using a piece of rolled out fondant (mixed with some tylose powder) and an edible food marker. No tracing, no Kopykake, just pure talent! After he was done drawing, I came in and painted the characters and let them dry overnight. After everything was dried…well not as dried as I’d hoped (darn humidity! ), the cake was put together and sent off to the baby shower! Wow - you are so talented! 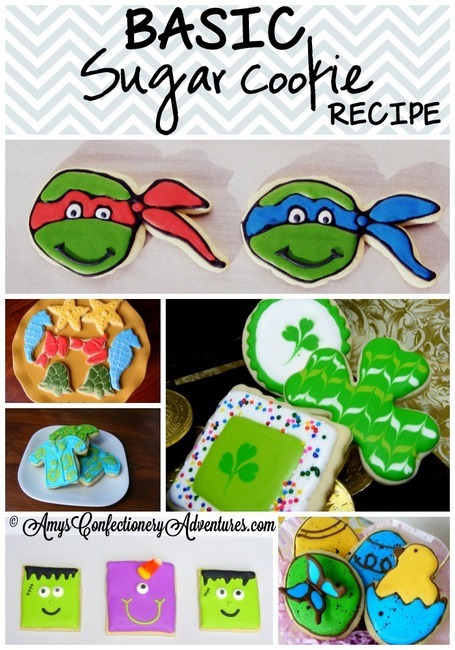 Those swirlies are so cool - what are candy melts? Thank you, Vicky! Candy melts are small, colored discs of decorating chocolate. 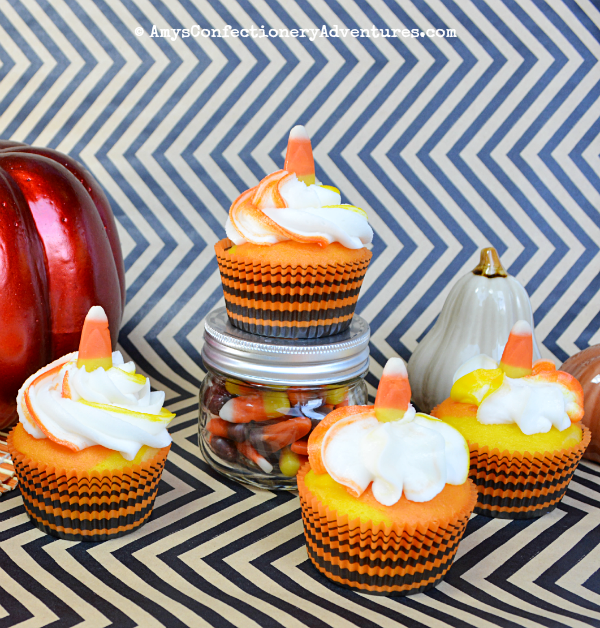 They are usually available at craft stores in the cake/candy decorating section! Even Walmart may have some in their wedding section! That is the coolest cake ever. I want one for my birthday! Wow! This cake is amazing! You and your husband are so talented! Wow that is so awesome looking. You did a great job!